The Menno Simons Centre has been one of the biggest blessings in Vancouver to me. I was privileged to live at Menno for two years and it still continues to be an important part of my life. I had never experienced Christian community like I did (and still do) at Menno in such a profound way before. I fondly remember the many times we rejoiced together over good news and supported, loved, and cared for each other when times were rough. I have made many good friends during my time at Menno and the deep relationships that have formed through doing everyday life together have profoundly enriched my life. The have made me a better, more Christ-like person. I also deeply appreciated my [Residence Coordinators] who made Menno a home for all of us, serving us with a humble heart and listening ear. Last but not least, I was very thankful for the great location in West Point Grey. Besides West Point Grey being the best, most beautiful neighborhood in Vancouver (and its being close to many amenities, green, safe, and family-like), I enjoyed most getting away from campus where everyone is busy, always studying, and usually stressed out about studying. 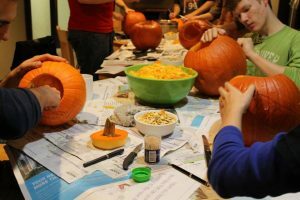 I felt that the relaxed atmosphere at Menno, because it was away from the stressful campus life, led to many wonderful board games or movie nights and discussions in the kitchen, which nurtured the relationships and community. I am very thankful to God for my time at Menno, it was such a blessing! I have heard more than once from former residents: “How I miss Menno! My best years in Vancouver were the ones at Menno!” And I can testify that this has been true. The Centre is a privileged space of communion; Menno has been an important place for spiritual formation for many, where we can think about how faith and practical life are weaved together in a specific community. During my two years at the Centre, the Christian faith I have heard about at Regent [College] had a privileged space to be tested, refined and lived out. If I lived by myself, I would not be challenged to connect head, heart and hands as much as I was at Menno. Doing house duties together, praying in community and even hallway conversations were opportunities to show God’s love and extend his grace. I was also challenged to love those who were different and strange to me; but in the context of a loving community, the stranger can become a friend. I have been deeply blessed by the friends, birthdays and celebration. Many times, after a stressful day on campus, I would be received by friends with joy and care. Once when I was sick, I didn’t not need to cook for myself, but received the generosity of others. The friends we made at Menno have been a blessing to my life in many ways! As I move [home], I realize how Menno has positively shaped my years in Vancouver. One of the challenges of living at Menno is to keep alive the vision of a Community house where people grow in Christ and encounter brothers and sisters that then can share burdens and walk together. This is not only a dorm, it is a Christian community where sorrows and joys of life can be shared. Menno has the real potential to influence positively the students in formation years; and that should not be taken for granted. We are close to campus, but do not reflect the impersonality of it. But it takes time openness, effort, and the Grace of God to build a community that is a sign for the world of true communion. The Menno Simons Centre, for me, has been an answer to prayer in the most perfect way. I’ve been starved of Christian fellowship until I came here in the Summer. Living in community challenges you to be the people who don’t always think the same way you do, to have grace for others at different stages of life, to allow others to see your weakness and be comfortable with that, and ultimately to uphold Philippians 1:27 which states “Whatever happens, as citizens of heaven, life in a manner worthy of the Gospel of Christ.” I have no doubt that living in this community with transform the characters of those who live here and in that, lead to spiritual growth, which for me is the ultimate gift. Thank you. As I sit in class and don’t have to worry about where I will lay my head tonight, I say thank you and I have and affordable home in the MSC. As I get on the bus to head home, thank you that home is near enough to school that I only have to take one bus, that home is near most of all the shops I would need to use, and that it’s in a beautiful part of town. As I walk up the driveway, thank you for the gardens and green space around the house, and the ladies and gentlemen who take care of them. As I walk in the back door, thank you for a roof over my head (a new roof now), and thank you that 99% of the time the appliances, plumbing, and electricity are in working order. As I walk into room 210, thank you for a space to call my own and a bed to lay my head. As I walk into the commons area, thank you for Christian housemates – young men and women who enrich my life, challenge me to see the world differently, and encourage me along in life’s journey. As I prepare a meal and sit down to enjoy it, thank you for kitchen time conversations and dinnertime laughs. When I have gotten off the phone (the one in the phone booth) and need to talk with someone about news from back home, thank you for friends who are here to listen. When I walk the silent halls late at night (because my mind is running or because of the caffeine I drank too late in the day) and I reminisce on past memories and future possibilities, I’m reminded to say thank you for those who have gone before us and those who will, hopefully, come after us. As I stand in the chapel, surrounded by men and women who have been used by God to bring all this about for me, for us, I’ve once again become aware that I’m a small member of a larger whole, a larger Body – a Body that works when I don’t see – to provide all these blessings for me, for all of us students at Menno. Thank you God, for that Body, the Body of Christ. I have had the privilege of living at the MSC over the past year and during this time the Centre has become much more than a building to me, it has become my second home. This is a place where I can escape to after a long day of school, a place where I can interact with and be challenged by others in the Christian community, a place of much laughter and a place that has allowed me to meet many, many good friends. I have been blessed to grow in this community as I learned to be more independent and endeavor to find out where God is leading me. I have been challenged as I discover what it means to live the good life, through discussions with others and through practicing how I should act as a community member. I have been loved by the community that has formed here and by the alumni and others. I would like to thank you for supporting this place, through donations, prayers and hard work. It has changed my life over the time that I’ve spent here, and I hope that many people will continue to be blessed by living at the center in the years to come. What has Menno Simons Centre meant to our family? Our family has had the privilege of connecting with Menno Simons Centre in Vancouver as five of us have enjoyed the ministry of the Centre over the past 10 years. Two of our children lived at Menno Simons Centre a while back and now our third child is in her first year there. 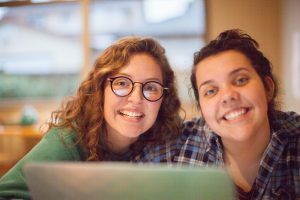 While experiencing the vicissitudes of their first years at the UBC and the city of Vancouver, Menno offered a vibrant, supportive community context. Moreover, a young man who is now our son-in-law lived at Menno during his one-year practicum placement at the French Consulate in Vancouver. His research about where he might find a Christian community in Vancouver during his practicum led to Menno Simons Centre. Finally, I also had the opportunity to live at the Menno Simons Centre one summer while engaged in full-time professional upgrading at UBC. You might have guessed that our eldest daughter and son-in-law met at Menno, which is also a healthy setting for the beginning of life-long love. You could not have guessed though, that our son’s room was one that Mother Theresa slept in while she visited there while is was still operating as a Convent. Something that each of us experienced there was genuine community. During her stay at Menno Simons Centre, our eldest daughter was diagnosed and went through treatment for thyroid cancer. The residents and house parents at the Centre were supportive throughout that challenging time in her life. Our children and I also found the Centre to be a place of spiritual nurture. By being a safe place, Menno Simons Centre allows its residents to be open about their questions and doubts. By living out consistently with its Christian and Mennonite heritage, it offers direction, and in particular points it residents to God and to the Christian Scriptures. Though I was not part of a Bible study group at Menno during the summer I was there, our children participated in weekly peer-led Bible studies. Along with shared meals, and distributed responsibilities like chores, each member can make a positive contribution, which builds trust, healthy interdependence, and community. With the location of Menno Simons Centre near UBC but also a quick bus-ride away from down-town, residents get a balanced experience on and off campus. The Centre is well-maintained, a pleasure to visit, and breathes a sense of stability and permanence as the sturdy building looks very much today as it did thirty or more years ago when we first visited worship services at the Point Grey Church while I attended Regent College. A guest room is available by reservation, and though I have only used it once, it functions as a ‘welcome mat’ should the need arise for out-or-town guests of residents. We are grateful to God for the leadership and vision that the Point Grey Church had to establish Menno Simons Centre for off campus housing. It has made a positive, lifelong impact on our family. It would be difficult to sum up the impact of the two years that I lived in the Menno Simons Centre, first as a student resident, then as an RA; it was a transformative blessing for me spiritually, relationally, intellectually, musically, and in a host of other ways that I’m still discovering. 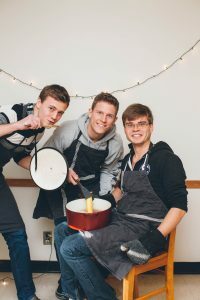 The MSC offers a unique opportunity to discover what “Christian community” really means—not as a an abstraction, or a once-a-week social group, but in the real details of everyday life—in shared kitchen space, shared food, shared ideas, shared music, shared struggles. Coming to a city where I knew no one, I thought that I would have to Craigslist a basement apartment and survive my two-year program at Regent in a kind of solitary confinement; the MSC became my home in a way that I couldn’t have imagined. Through being involved at the Centre, developing relationships with the residents and RCs, and participating in Point Grey Inter-Mennonite Fellowship on Sundays, I was both challenged and encouraged to think about what “faith” means when applied in a real-life setting. My one regret about my two years at MSC is that it was only two years, but I am thinking about how to apply the lessons I have learned here in the rest of life. 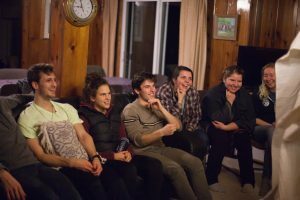 Best Memories: Winter retreats at Hemlock; leading Monday night Bible studies; spontaneous music nights around the piano; Saturday morning potlucks; late-night conversations in the upstairs kitchen; urban gardening; going to coffee or the pub with fellow residents. What I took from MSC: I learned how to garden, and how compost can be a beautiful thing. I learned that living simply is not in opposition to living well—far from it. I learned that even introverts need people to talk to sometimes, and how much of a blessing it is to live with those people. I learned how much more fun music is with multiple people, and how Mennonites are born singing four-part harmony. I learned that disagreeing with people, even about important things, did not make them “bad” people; in fact, these people taught me most. I learned that real “education” does not happen in a classroom, but wherever real life happens and real questions are being asked. I learned that “community” requires sacrifice, but it’s precisely the fact that it’s hard that makes it valuable.